Hampshire College is on its way to becoming 100-percent solar for its electricity on an annualized basis as it underwent its final “witness test” with the utility Eversource on Tuesday November 28, and is awaiting permission to switch from conditional to full operation of its entire 19-acre solar-energy system. One of two solar-array fields has been operating since June after a first successful witness test. 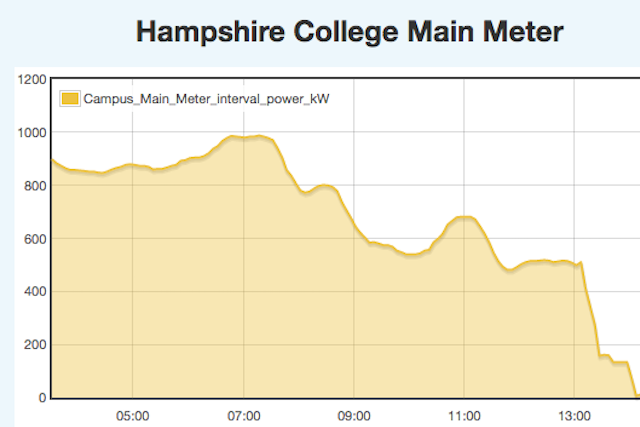 Campus leaders believe Hampshire is the first US residential college to go 100-percent solar from on-campus sources. Assistant Professor of Ecosystem Ecology Seeta Sistla discusses her research of the ecological impacts of solar-array fields. Under a power-purchase agreement, the 15,000 photovoltaic-panel arrays on two fields were built and are owned and operated by SolarCity, and Hampshire is purchasing the electricity from the company at a fixed rate, roughly half of what the college had been paying. The project is estimated to save the college almost $400,000 a year in electricity costs, for up to 20 years, for total savings of up to $8 million.The college’s two fields together have a capacity of 4.7 megawatts DC. The greenhouse-gas emissions eliminated — 3,000 metric tons/year — is equal to taking almost 650 cars off the road. The project is part of Hampshire's Climate Action Plan and Sustainability Initiative detailed below. Listen to College President Jonathan Lash talk about the project this week with the national Living On Earth radio program and WAMC Northeast Public Radio. Hampshire has secured conditional approval to operate its second field on the west side of campus, on its Hadley property, and is making final adjustments to system parameters to receive full permission from Eversource to operate the whole system. These arrays join other renewable-energy sources on the college’s properties: rooftop solar arrays on its new R.W. Kern Center, the CSA Barn, the president’s house, and the canopy atop the Chuck and Polly Longsworth Arts Center. Led by its Environmental Committee, Hampshire has been planning how to generate 100% of its electricity from renewable sources since 2014, and the board of trustees approved a plan for the construction of large solar arrays on campus in February, 2015. After reviewing a couple dozen possible sites on the 800-acre campus — to ensure the array fields would maintain ecosystems, improve soil quality, and promote research and education — the college chose two optimal fields. The committee’s goal was to demonstrate the coexistence of renewable energy with agricultural use, and to preserve the soils and lands so they can be returned to use for agriculture or other purposes as desired by future leaders of the college. President Lash said that by implementing its Climate Action Plan and moving ahead on a project of this magnitude, Hampshire is practicing its mission in the areas of education, research, and environmental justice. Hampshire students have not lived through a normal climate year, said Environmental Committee member and School of Natural Science Dean Steve Roof last August, at the groundbreaking for the system. A week before, Roof had been in the Arctic leading undergraduates on an annual climate-research trip. “The glacier I walked on is now forty feet thinner compared to when I walked on it ten years ago,” he said, adding that the last month when global temperatures were below average was December 1984 — almost 33 years ago. Almost as soon as construction began on the array fields, Hampshire students and faculty began research projects about them. At the School of Natural Science Symposium in May, graduating students Josia DeChiara and Rachel Rosenberg presented their yearlong study of the ecological effects of photovoltaic arrays, conducted in collaboration with Seeta Sistla, assistant professor of ecosystem ecology. They then presented at the Ecological Society of America Annual Meeting this summer, and have continued their research since graduation. Jonathan Lash observed that worldwide, in 2016 more than $300 billion was spent on renewable energy; that's more than 50 percent of all of the money spent in the world on electrical power. Jonathan Lash is an accomplished environmentalist who was appointed by two US presidents to federal environmental councils. He now serves on the board of three environmental organizations. Lash has announced his retirement from Hampshire College in June 2018. Read his HuffPost blog. The solar-installation project has been managed for Hampshire by its Facilities and Grounds Projects and Operations Manager Todd Holland, working with former director of facilities Larry Archey and current director Carl Weber, advised by the Environmental Committee. Fossil-fuel divestment. Hampshire’s divestment from fossil fuels was completed in December 2011 after the board of trustees enacted a policy of choosing endowment investments based on attributes aligned with the college’s values, such as avoiding investments in businesses that practice substantially harmful environmental practices. Climate-Action Plan. As a signer of the American College and University Presidents’ Climate Commitment, in 2012 Hampshire released a draft Climate-Action Plan to make the campus climate neutral by 2022. R.W. Kern Center. In 2016 Hampshire opened the R.W. Kern Center, funded by private donors and conceived to meet the world’s most stringent green-building standard, the Living Building Challenge. Designed collaboratively by architects and builders along with a committee of faculty, staff, and students, the Kern Center has been hailed by, among others, the American Institute of Architects and National Geographic as a national model green building and a living laboratory for education. Hampshire College Farm. Hampshire has expanded the educational and operational role of its campus farm, one of the oldest working farms at a liberal arts college. The college established the Center for New England Food and Agriculture to serve as a hub to strengthen regional collaboration and partnerships in food sourcing. Conservation of college land. In 2015, Hampshire permanently protected 46 acres of its property on the Mount Holyoke Range through a conservation restriction. Lawns into meadows: the campus quad. In 2014, the college eliminated a large traffic circle and parking lot at the center of campus, transforming it into a space for people and creating a green quad of lawns and meadows. The college also ceased mowing a dozen acres of lawns to create more ecologically diverse meadows throughout campus that reduce greenhouse-gas emissions, create wildlife and plant habitats, save on landscaping expenses, and provide learning and research opportunities. Watch a video about this project. Hitchcock Center for the Environment. In 2016, Hampshire’s campus became the new home of the Hitchcock Center for the Environment, when the popular environmental educational organization moved into a newly built headquarters designed, like the Kern Center, to the advanced green standards of the Living Building Challenge. Green revolving funds. In fall 2011, Hampshire joined more than 30 other leading institutions to launch the Billion Dollar Green Challenge to invest in self-managed green revolving funds that finance energy-efficiency upgrades on campus. Hampshire’s Sustainability Revolving Fund (SURF) has provided loans for campus upgrades that improve efficiency and conserve resources. Campus renovations. Hampshire has made other major efficiency improvements throughout its campus for the conservation of energy and water, such as renovating the Cole Science Center, funded by a $1 million gift; repurposing the wood from an old barn into a student community building, the Roos-Rohde House; and extensively upgrading spaces throughout the campus. We Are Still In campaign. In 2017, Hampshire signed on to the national We Are Still In campaign and pledged to continue to support climate action and reduce carbon emissions to meet the Paris Climate Agreement, joining more than 1,200 founding signers (and now 2,600 total signers) including US cities, states, businesses, investors, colleges, and universities. Electric car–charging station. Students and employees gained access to an AeroVironment dual-dock charging station behind the library when Nissan donated it to lay the foundation for a replicable model of electric-vehicle infrastructure. The College just installed a second electric-car charging station under a grant from MassEVIP (Electric Vehicle Incentive Program). The chart in the gallery below shows the drop in electricity to campus from the region electrical grid when the College first powered on its full solar-power system the afternoon of November 28, 2017. "This is our chance to secure our future as a College focused on high-impact, lifelong learning."